My Grandmother could probably make great coffee from tree bark if she had to. She uses a percolator that my Dad was going to throw out sometime in the mid-sixties. (He reverted to his roots and made chicory coffee by pouring the ground coffee into the bottom of a saucepan, filling it with water and dropping in an egg shell “to keep the grounds down.” You could stand a spoon up in it, but you only needed one cup a day.) Either way, you had time to sit and chat while the coffee was brewing. I wonder if the art of conversation is beginning to suffer in our rushed world as we order coffee to go and gulp it in the car? Well what about my coffee? I once had a roommate hold a pot of coffee I had made up to the light. “You should at least be able to see a little red glow through the pot,” he said. “But you do only need one cup of it.” Like father… . Pete made the coffee for the next two and a half years. Twenty years later I’m still working on making a cup as good as the local barista at the Starbucks. 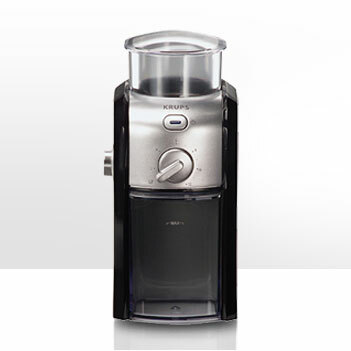 But following Mr. Mcgregor’s dictum from “Black Hawk Down” I chucked my old blade style coffee grinder and asked for a Krups GVX2 burr grinder for Christmas (like the one in the photo above.) Wow! What a difference. Before the GVX2 came along, I was ready to hurl the combination coffee and espresso maker out the window. Now I select the number of cups I want to make and the size of the grind depending on the brewing method. Slower brewing in the drip coffee maker or the French press requires a larger grind. Espresso is ground to dust. And the coffee is good! Now I have time to sit and chat with Ms. E or my in-laws over a cup or two. And that is a far more elegant start to the daily grind. This entry was posted in Living and tagged gear, Living. Bookmark the permalink.